We climbed on the end of July in 2018. The west side approach was great till the Charlotte Creek camp site. We scouted the approach the day before we climbed. Otherwise, it would have taken longer to get to the route. The bushwhacking with gears was adventure itself. The route is straight forward, if you follow the topo. Nothing crazy in terms of its grade and the route is consistent and great. Definitely be on the line for the permit around 6am, if you climb on weekend of Summer. I highly recommend the route especially if you have not visited the park. Beautiful! You get to see bears all the times as well. We stashed a blue Black Diamond pack near the base of the slabs on Saturday 9/24 with the plan to recover it on the descent. Ended up descending in the dark and got lost and never found it. If you find it, feel free to keep it. Or if you happen to be returning to the Bay Area, I'd happily trade a case of beer for it (I'm in Sunnyvale). We did the west side approach and camped out at Charlotte creek. The Bubbs Creek trail is really nice and goes by really fast. The last section of the approach up to the dome is a little miserable, but following the cairns isn't too bad. I thought the slot pitch and the furrows were both a ton of fun. The rest of the route is just mediocre, but the setting and views are amazing. If I were to do it again, I'd plan for 3 days. We ended up a little too rushed with only 2 days. Agree that the West Side approach is nothing to worry about. If that shuts you down then yes, I guess you don't have what it takes. Maybe pick a little cooler weather (and certainly it is far more viable in the Spring when high passes are more trouble than they are worth). Makes the route far more doable for West Side urbanites instead of a 1/2 day more drive. Don't listen for a second to someone with zero experience comparing a high country mega classic like Charlotte Dome to some well worn highway in Yosemite Valley. I know a thing or two about Classics and this is one not to be missed. Unique setting, great length, unique rock features and fantastic adventure far from the beep of horns and tourists. Criticism of this route is clueless at best. There is not a multi-pitch 5.8 in North America better. 12 Pitches with adventure until the very end. Here's a video with snippets from every pitch. The actual climbing begins at 2:49. If anyone finds a camera at the base let me know. This route is awesome. Original and fun. Thought it was well protected too. Did this route a few weeks ago and it was great. Awesome setting and very featured granite. Route finding was what we exopected, a great adventure. Not a hard climb, but being 12 miles in I don't mind a crusier for 12 pitches. I posted a topic on the ST about California Condors after the trip, as we saw one during the climb. Perfect three day trip. We bivied at Charlotte Lake to make the hike in with full packs a bit shorter. Did the approach 3 miles, climb, then back 3 mile to Charlotte Lake on the second day. Hiked out from Charlotte Lake on day 3. Like the ski in idea!! Sometime in late March 1992, Rich Henke, Nancy Jensen, Peter Green and I, skied to Charlotte Dome from Onion Valley and climbed the South Face in very cold, late winter conditions. The climb was great, the descent took everything out of us. Many rappels off trees down snow covered slabs, that in summer were easy walk, caused us to get back to the base the next day in the early morning. Same day ski out followed. Looking at the climb after all these years, the route is very suitable to a late winter ski and climb combination trip. Since the route faces south and receives a lot of sun, it dries quickly after late winter storms. 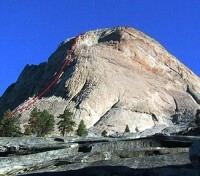 The approach via Kearsarge Pass and the long ski down to the Dome are great and the climbing is very good. I completely disagree with the comment below, this is indeed one of the real classics of the Sierra, summer or winter. P.S. If this climb was located in Yo, none of us would ever get on it. It would be like "take a number" and come back in couple of weeks! i did this route two weeks ago and have been meaning to write a trip report. but for now i just have to say i disagree with the last comments. if you didn't like this route then i don't know what to tell you. the route we climbed was obvious, clean and fluid (and matched the supertopo description quite well with a couple small exceptions - e.g. topo pitch 9 is NOT runout unless you want it to be). it climbed well, was more than well protected, and super classic. a worthy outing to say the least. I just did this route over the first weekend in October via the west "Road's End" side. I really don't get what the big deal is with this route. One guide said it was perhaps the best of its grade in the Sierras. I found it boring and awkward, as well as hard to follow. So did the experienced party behind us. And for the beginner, the runouts are just too long. If it were in the Valley, I would call it a two-star route. That far in the back country? Probably not worth it. Pitch 4 is shorter than you want to think and the "chimney" is more of a wide flaring crack (though there is a chimney to the right that doesn't lead to the Slot but has rap slings). You should be able to spot the "slot" pitch above. Pitch 7, the awkward dihedral, is lame. The party behind us found a better route to the left. Pitch 8 is a complete mystery to me. But if you get it wrong, you will miss the "Furrows" pitch. This was the crux of routefinding for me. Also the head crux. Long runouts not for the beginner!! Pitch 9 is hard to orient without mentioning the giant buttress over your head (not in the guide). I think the route goes to the right of it and the next pitch is straight up the last half of it. Hike down is long but once on the main trail is really pretty. Approached from the East via Kearsarge pass and camped at Charlotte lake for kicks. It made for a long day on the climb but overall proved well worth it. Weather was amazing and only one other party on the route arrived at the base about 45 mins after our 7:30AM start. Route was great and from what I can tell we stayed on route all the way to the top. My only confusion was on pitch five from the ledge where the ST guide shows you climbing up and right (5.6 move) and then traversing to the awkward corner. The guide shows 70 feet and the traverse follows the natural dike. After much back and forth I decided the traverse length was more like 15 feet to the major obvious corner overhead. It proved fun and...awkward none the less. Great route and a liftime one at that. Approaching from the West, there is a very good climber's trail just West of Charlotte Creek. The pitch just below the Slot pitch seemed to be about 100' to me. With a 60m rope, the Slot pitch can be easily linked with the traversing pitch above to bring you to a nice ledge. The big ledge below the last pitch would make for an amazing bivy. This is an excellent route with many options. I would recommend from the top of the 8th pitch (semi-hanging belay) going left, then straight up (160 to 170 feet total) to a big comfy ledge at the base of a left facing corner. It's then easy to get on the arete and go up to the alcove (or even almost all the way to the big sandy ledge with a 60m). The ledge is a welcome break at this point in the climb! Did this route on Memorial Day weekend. Although there's still patches of snow along the approach trail (especially on the East side of Kearsarge Pass), Charlotte Dome itself was clear (there's a few patches on the descent, but you can avoid them). Really fun route. Not sure how you can make this into 12 pitches, however. We did it in 9 (one of which was a screw-up because I got us off-route chasing after booty). (note: I was using Croft's book for beta, so his route may be a tad different then the Supertopo version). Approach from the west: From the campspot (junction between Charlotte & Bubb's Creek) follow Charlotte's creek on the left side. Stay away from the creek to keep you out of the bush!! After 10 min you should start seeing cairns. Follow them and you should begin to see traces of a faint climbers trail. The trail will lead you far from the creek ( 50-100 mt) and from the hideous bushes. The trail zig zag up following a dry creek. The trail is steep but no bushwacking is required! Follow the faint trail all the way up. You will eventually have some cliffs on your left, do not climb those but leave the cliffs on your left. When you start seeing the bottom slabs of the dome keep left following the cairns. Once you reach the base of the dome keep left and proceed for further 20 mt. You will encounter the dead tree that Chris describes in the topo and hopefully the start of the route. From the start you will clearly see a small pine with several webbing to rappel down. Estimated time to reach the start from the campsite : 2 hours max.